Installation: Copy the .ms file to your scripts\startup folder or run as a script if you want to try it out first. The object primitive will be available under Geometry > Examples in the Create panel. 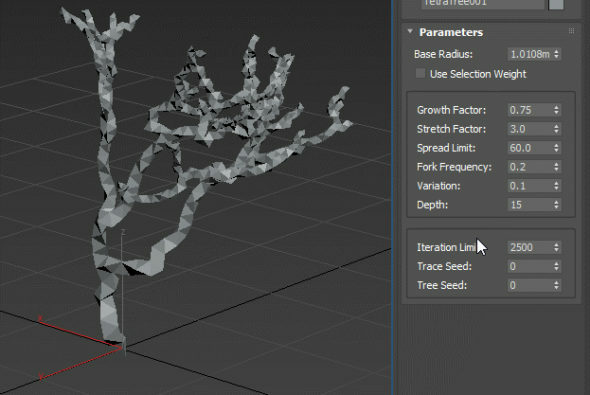 Note: Weighted selection mode woks out of the box only in max 2018+, in lower versions, you can apply Edit Mesh modifier and switch to Vertex subobject level. Warning: Execute caution when playing with the values, especially with high depth and iteration numbers. While there are some safeguards in place like the iteration limit, you can easily reach recursion limit of max (IIRC somewhere around 5000) and if that happens, max will crash. It was made on a whim, I don’t plan on making it any better or more clever.